Celebrate with us at Holden House! 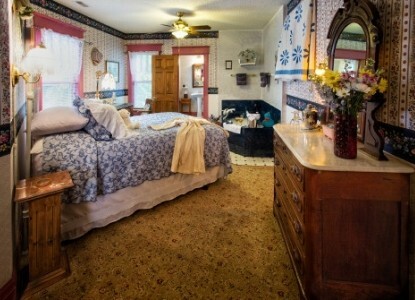 This beautifully appointed room is a lovely two room suite reminiscent of English elegance and romance. 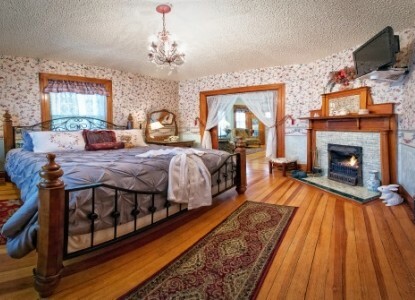 From the old fashioned white iron queen bed to the marble topped Victorian dresser, the mountain view to the mahogany fireplace, the private sitting area to the Roman marble "tub for two", the private bath with fluted porcelain pedastal sink to the separate marble shower, this suite offers the best of everything. Decorated in hues of deep blue and soft white with floral touches, this room offers a touch of Springtime in the Rockies. 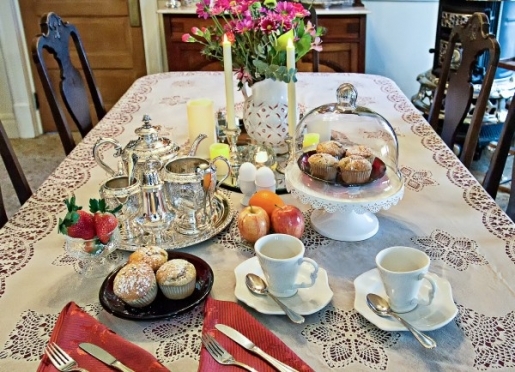 Ask about our "breakfast in bed" Romance Package. 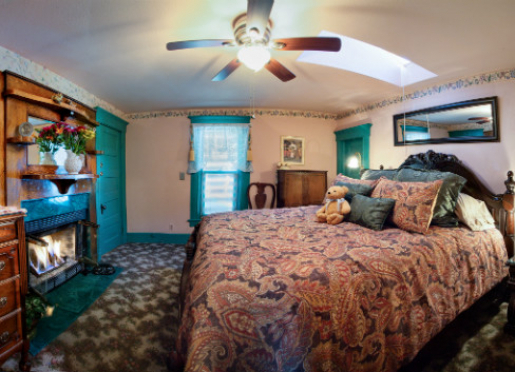 Romance Package additional $15 charge plus room rate per day. *fireplace operated during winter months only. 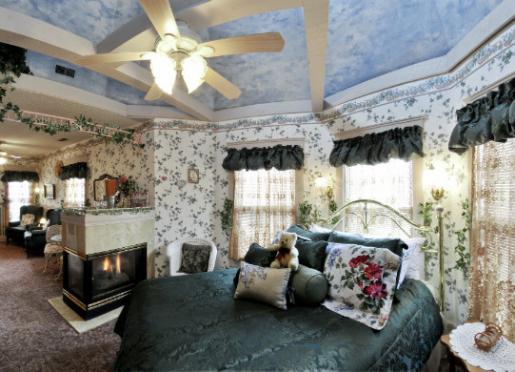 The open beamed turret with hand painted sky mural, see through fireplace, private sitting area, mountain view and oversized "tub for two" make this suite a honeymooner's dream. 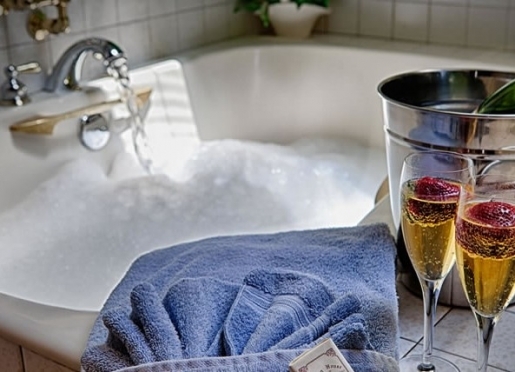 Snuggle up in the comfortable reading nook with a good book, indulge in the garden "tub for two" (bubbles included! ), and awake in your queen four-poster brass bed. The bath also includes a separate marble shower. 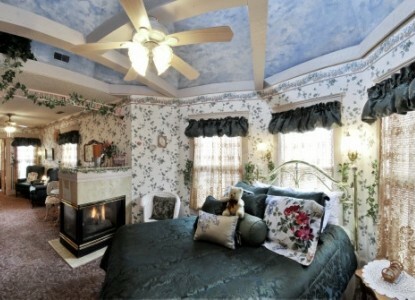 Decorated in ivy wallpaper with accents of blue and rose, this suite gives the feeling of sleeping in a garden. Ask about our "breakfast in bed" Romance Package. 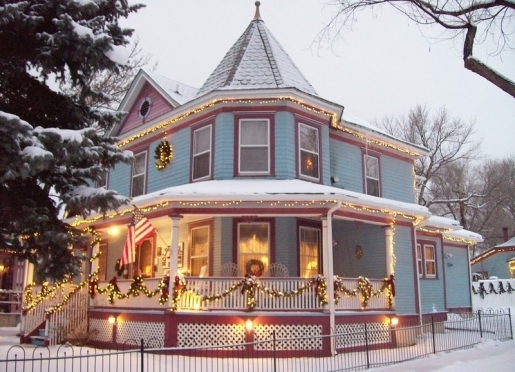 Romance Package additional $15 charge plus room rate per day. *fireplace operated during winter months only. This 2nd floor suite is a Rocky Mountain delight. 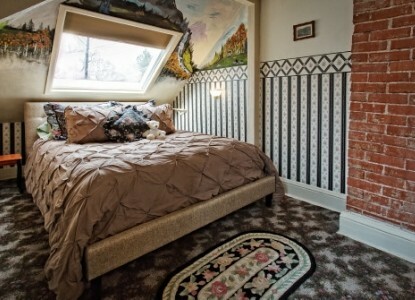 Imagine gazing at stars through a four-foot skylight above your queen bed. 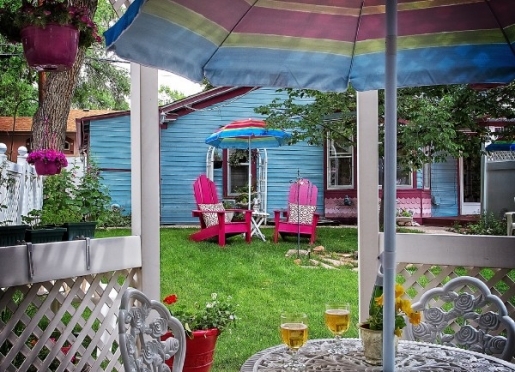 You'll be surrounded by hand painted scenery featuring Pikes Peak, Garden of the Gods, Seven Falls, pine trees and aspens. 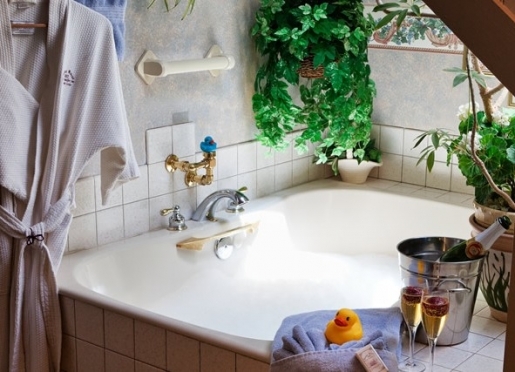 Take a relaxing soak in the bubble-jet spa corner "tub for two" which also sits under a skylight, complete with hand-held shower. This enchanting gabled room is graced with waterfall furniture that belonged to Sallie's grandmother and a cozy oak framed fireplace. Ivory, and ebony touches add to the light and airy feel of this delightful suite with dormer windows. Privacy and seclusion is the hallmark of this room with a view. 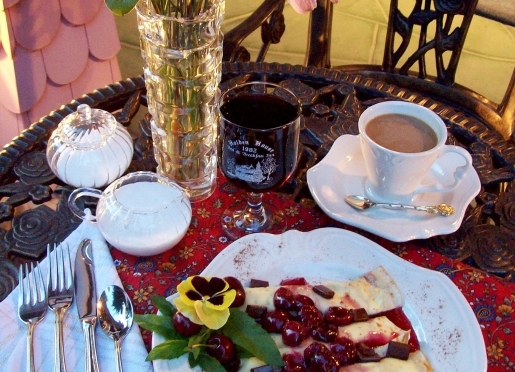 Ask about our "breakfast in bed" Romance Package. Romance Package additional $15 charge plus room rate per day. *fireplace operated during winter months only. This 1st floor, private and traditional style two room suite is luxury at its best. The cozy sitting room with a loveseat, and bedroom with mahogany queen four poster bed under a skylight and antique remote-control mission oak fireplace with beveled mirror, let you take a step back in time. The bath with a deep marble Roman "tub for two" and shower combination and malachite marble sink add to the ambiance. Rich deep colors of emerald green with peach accents gives it a traditional atmosphere. 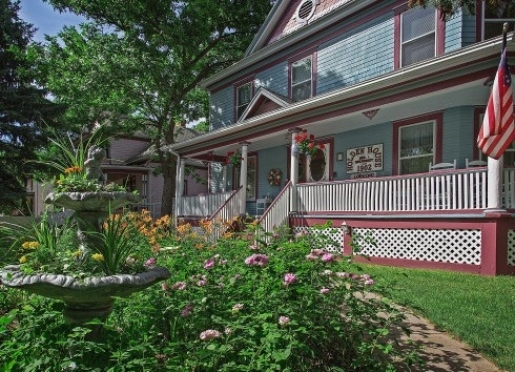 View our "secret" back garden with lattice gazebo and fountains from your bedroom window and dream about a bygone era. Ask about our "breakfast in bed" Romance Package. 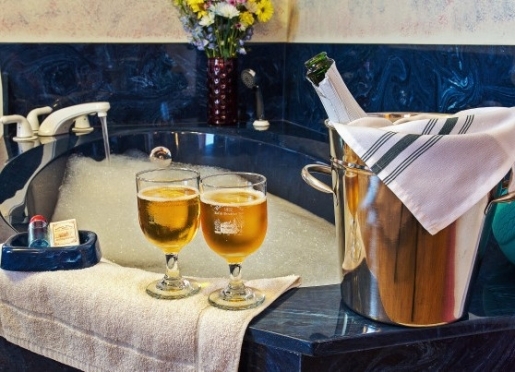 Romance Package additional $15 charge plus room rate per day. 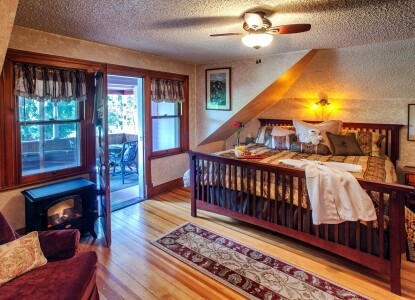 Guests enjoy accommodations in this 1st floor private luxury suite. 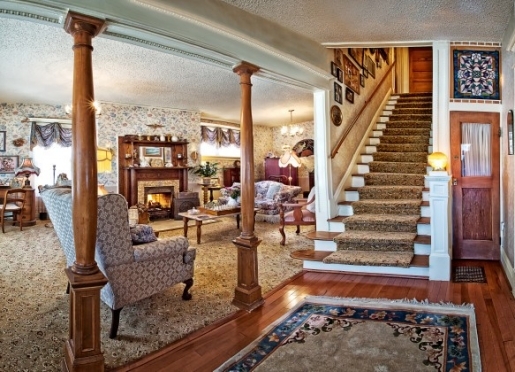 The moment you step inside the foyer of our adjacent Rose Victorian home, you'll be touched with elegance. Decorated in soft colors, this two room suite boasts hardwood floors, a bedroom with four-poster king bed and original wood columned tiled fireplace with beveled mirror and updated with easy remote control gas operation, a private sitting room with bay window and mission oak loveseat, and a spacious bath with a marble Roman "tub for two" and separate marble shower. Holden House received the highest Tripadvisor rating from a guest who stayed in our Independence suite's disabled facilities! Pikes Peak - This beautiful premier king suite is located upstairs in our adjacent Rose Victorian and offers over 1,000 square feet of space to relax with beautiful hardwood floors, a bedroom with a king size arts and craft style bed and private balcony, kitchenette with dining table, its own separate living room/parlor and private bath with standard tub/shower. 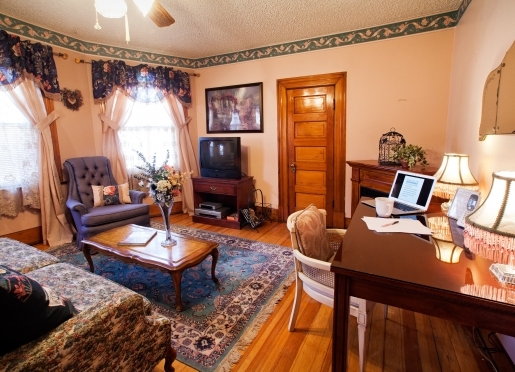 Color/cable TV, DVD, telephone and free WiFi are included. Please inquire at time of booking about extended stay rates. Check in hours are normally from 4-6 P.M.
We ask that advance arrangements be made for arrivals after 6 P.M. as we like to personally welcome and greet our guests. So that all guests can enjoy the peace and quiet of the inn, check ins are usually not permitted past 9 P.M.
Room rates vary depending on availability, occupancy and season. To avoid disappointment, advance reservations are recommended. Generally, a first night or 50% deposit (whichever is more) is required to hold the reservation. An advance deposit on a valid credit card will confirm the reservation immediately and will be charged at the time the reservation is made. A written confirmation will be sent via email upon deposit receipt. Certain rules apply to holidays, special events, special offers and group reservations. Due to the inn's limited number of rooms, cancellations of all confirmed reservations must be made One Month (Non-refundable -holidays/special events/packages) in advance of the scheduled arrival date or your deposit will not be refunded. If reserved rooms are rebooked for the same dates as the originally scheduled reservation, your deposit may be applied to a future reservation within one year. All cancellations and reservation date changes are subject to a $15 handling charge/night reserved regardless of date of cancellation or change. Guests are responsible for payment of all nights reserved, regardless of actual arrival or departure date. Full payment is due upon arrival. Special cancellation policies apply to discount and packages and guests will be informed at time of booking. Please check your written confirmation carefully for correct dates and room information. The Independence Suite in our adjacent Victorian offers disabled parking area accessible from ramp. Transfer shower with seat, grab bars, separate bathtub with ledge and grab bars, water closet/toilet area wheelchair accessible, smoke alarm meets ADA for hearing impaired, doorways sufficient. 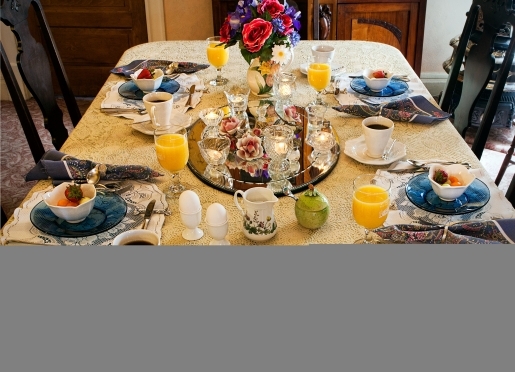 Breakfast served in suite for no additional charge, since main house is not accessible. Closed caption TV. 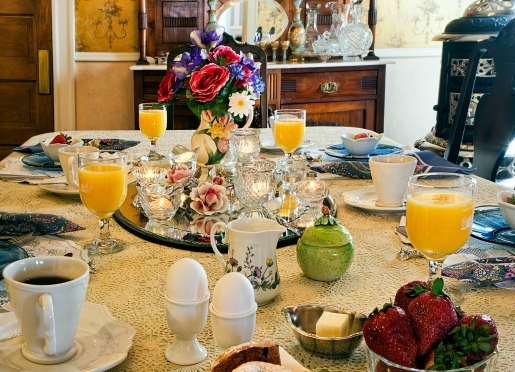 Thank you for making an inquiry about staying at Holden House 1902 Bed & Breakfast Inn.